Here is Some Information About Pazhavangadi Maha Ganapathi Temple in Thiruvananthapuram Kerala India. The Pazhavangadi Maha Ganapathi Temple is one of the renowned Lord Ganesh temples in Kerala, situated at the heart of East Fort, Thiruvananthapuram. 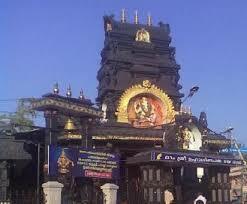 There are two images of Ganesha inside the sanctum -One made of Granite other made of gold. Though the temple is very small, there are also shrines for Sasthavu, Bhagavathy and Nagas.It is a famed Ganpati temple in Kerala with about 32 sculptures of Lord Ganesha in different forms. A temple, I never miss during my Trivandrum visits and breaking a few coconuts also a routine I follow here.The temple is situated in East fort and only about 200 meters from Sri Anantha Padmanabha Swamy temple.The temple was once an important place of worship in Kerala for the Travancore Army. Today, devotees throng this temple to seek the blessing of Lord Ganesha before beginning anything new. Breaking of coconut and offering modakam are the ways devotees show gratitude to this Lord Ganesha presiding in this temple.Other deities worshiped at Pazhavangadi Maha Ganapati Kovil are Lord Ayyappa, Goddess Durga, Nagaraja, and Brahmarakshas. 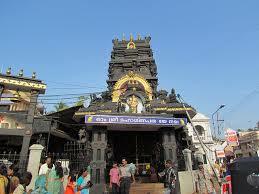 Pazhavangadi Maha Ganapathi Temple is a very famous temple, situated in the heart of Trivandrum. One can visit this temple and then visit the Sri Ananthapadmanabha TempleJust walkable distance only.This temple is being maintained by the Indian Army, while majority of the temples of Kerala are managed by the Devaswam Board and some are private.There is info about this temple in the Sakthi Vikatan of 27-4-2006 issue.When the headquarters of the Travancore Kingdom was at Padmanabhapuram (Now part of Tamilnadu), the soldiers who kept vigile at the fort were said to be disturbed by a Yakshi during night time. 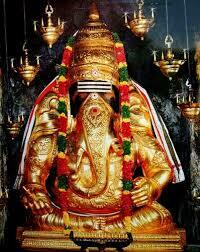 One soldier was an ardent devotee of Lord Ganapathy. He was given duty one night, he believed that the Lord will take care and went to have a bath in the river. He stumbled upon an idol of the Lord then and he took that with him when he went to keep vigil. He was unaffected by the Yakshi. A temple was built at that place for the idol and the soldiers worshipped the Lord. In 1795, the headquarters was shifted to Trivandrum and the soldiers shifted their Lord also.The present temple was built in 1860 and the Lord was kept there by the then ruler Maharaja Ayilyam Thirunal.Thus the temple is being managed by the Army. 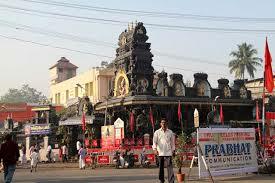 This temple is very famous, sitauted in the heart of the city and is always thronged by the devotees. The main ritual is breaking coconut, soora thengai udaipathu. Around 2500 coconuts are broken everyday.The place used to be a fruit market in olden days- Pazha angadi, and called Pazhavangadi now. Vinayaka Chaturthi (Ganesh Chaturthi), Ganesh Jayanthi, Varad Chaturti, and Sankashti Chaturti are the main festivals in Pazhavangadi Maha Ganapathy Temple. Special poojas (pujas) are performed for other Hindu festivals including Thiruvonam, Vijaya Dasami, Ayilyam, Sahasra Kalasam, Thirkkarththika, Thirvathira, Makara Vilakku, Maha Shivaratri, Vishu, Thriveda Laksharcchana, and Nira Puththari. By Road : There are many public and private vehecals available to reach Pazhavangadi Maha Ganapathi TempleThiruvananthapuram. By Rail : The Nearest Railway station is Thiruvananthapuram station. By Air : The Nearest Airport is Thiruvananthapuram Airport.